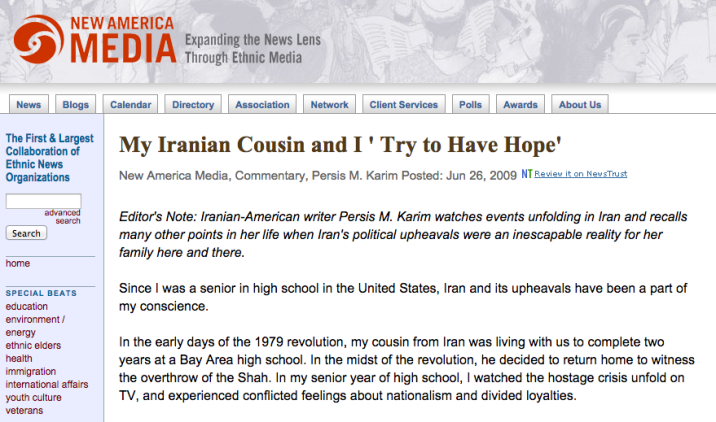 "My Iranian Cousin and I Try to Have Hope", New America Media, 2009 | Persis Karim, Ph.D.Persis Karim, Ph.D.
My cousin reassures me that things will change — little by little perhaps. She also assures me that Iranians are a peaceful people. They do not want war, don’t want intervention, don’t want to destroy their country from the inside out.